Christmas is an occasion mostly associated with joy and celebration. But since the start of the holiday season, India’s minority religious groups of Christians and Muslims have been especially under pressure. The Indian Parliament has hardly functioned since the start of December because several opposition lawmakers have been protesting a series of attacks against the nation’s religious minorities. The protagonists are Hindu nationalists emboldened by India’s largest political party Bharatiya Janata Party, BJP. 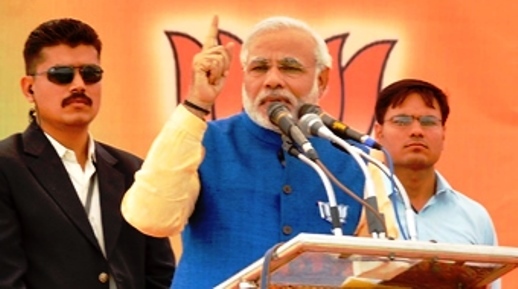 India’s Prime Minister Narendra Modi is a member of the BJP. The party controls a majority in Parliament and expresses a commitment to Hindutva, an ideology that defines Indian culture in terms of Hindu values. On the morning of Dec. 1, St Sebastian’s church at Dilshad Garden – a large Catholic church in a crowded middleclass area of Delhi – went up in flames. The interior of the church was destroyed before half a dozen firefighting trucks managed to extinguish the blaze. Hours after the fire, a Minister for food processing industries Sadhvi Niranjan Jyoti, who has been handpicked by Prime Minister Modi, stunned the nation with a provocative statement. A week after these incidents, 57 migrant Muslim families were ‘reconverted’ to Hinduism before the media by a Hindu fundamentalist outfit in Agra, a city famous for the Taj Mahal, 200 kilometers south of New Delhi. Nand Kishore Balmiki, the organizer of the reconversion, boasted to the media that they “will purge society of foreign faiths,” the largest of which in India are Christianity and Islam. The media reported that reconverts – comprised mainly of impoverished waste pickers – were encouraged to attend the ceremony by being offered ration cards, voter identity and a Below Poverty Line card that would entitle them to government welfare schemes. Further intensifying the situation, on Dec. 10 the Regional Head of another group of extreme Hindu nationalists, Rajeshwar Singh, is reported to have declared that 5000 Christians and Muslims will be ‘brought home to Hinduism’ on Christmas day at Aligarh – 160km south east of New Delhi – also in Uttar Pradesh state. Singh represents Dharm Jagran Samiti (DJM), a group supported by Rashtriya Swayamsevak Sangh (the RSS). The RSS is an extreme Hindu nationalist voluntary organization and the ideological fountainhead of the Hindu nationalism that the BJP espouses. The RSS has been linked to violent attacks against minorities over the past twenty years or more. The group’s initial claims stated that the ‘ghar vapsi’ (‘home-coming’) campaign would be the largest to date and that it would be led by BJP Parliamentarian Yogi Adityanath – known for his aggressive Hindu nationalist rhetoric. Under pressure from the Prime Minister, the RSS has now forced the DJS to call off the ceremony. However today (Dec 18) The Hindu reports that the DJS says the ceremony was postponed, not cancelled “in the strategic interest of the cause” and that the work of re-conversion will “continue slowly and steadily, but cautiously”. Rajeshwar Singh had claimed that Christmas has been chosen for the reconversion because the event is a ‘test of strength’ for both religions. “If their religion is better, they can stop them. It is a test for both of us. If they come to us on Christmas, it is the biggest rejection of the faith,” Singh was quoted as saying in the Economic Times on Dec. 10. India’s Parliament has been especially heated over the conversion debate, with opposition targeting the BJP. The party responded with a strong counter-offensive in support of Hindu fundamentalist’s stance on reconversions. Unfazed by the barrage of criticism in the Parliament and the media, Venkaiah Naidu, Minister for Parliamentary Affairs, on Dec. 13 called for national and state level anti-conversion laws. At the moment, five of India’s 29 states have laws that forbid coercing someone to change religions. The most controversial element of the conversion campaign emerged Dec. 15 when the Times of India unearthed a government circular of the education department attempting to shift children’s attention from Christmas to ‘good governance’ by recognizing a new Indian holiday on Christmas day. Good Governance Day is being established to encourage students to celebrate the birthdays of Atal Bihari Vajpayee, a former Prime Minister of India, and Pandit Madan Mohan Malaviya, a Hindu nationalist, educationist and politician. “The situation is alarming. This Christmas looks like it is not a pleasant one,” Bishop Simon John of Delhi Diocese of the Believers Church told World Watch Monitor following the alleged Christmas day circular to schools. “Mark ‘good governance day’ on Christmas, government tells schools” said the Times of India in its lead story sparking more vociferous protests in Parliament and outside. It published a photocopy of what it claims to be the government circular. The federal Human Resource Development ministry promptly denied allegations that it is requiring schools to now remain open on Christmas day. On Dec. 10, International Human Rights day, the Justice, Peace and Development Commission of the Catholic Bishops Conference of India expressed the anguish of the Christian community. “The most distressing is the situation of the religious minorities whose right to religious freedom is ruthlessly rubbished and trampled upon by the militant majoritarian groups that apparently enjoy utmost impunity in the new political ambience,” the Commission said. Alarmed by the developments including the Christmas ‘insult’ to the Christians by the federal government itself, the National council of Churches in India (NCCI) has taken an unprecedented step by deciding, for the first time, not to invite the Chief Minister of state for its annual Christmas prayer meeting. “We used to invite the chief minister every year. But considering the Indian political context and protests by the minority communities we have deferred in inviting the CM for Christmas Prayer Breakfast” Rev. Christopher Rajkumar, Executive Secretary of NCCI’s Commission on Justice, Peace and Creation told World Watch Monitor from Nagpur on Dec. 16. Headquartered at Nagpur, the second capital of Maharashtra state, NCCI consists of 30 Orthodox and mainline Protestant churches. Maharashtra state came under BJP rule after the state elections in October. “This Christmas evokes not joy but fears. It should not happen. But is happening,” Rajkumar said.